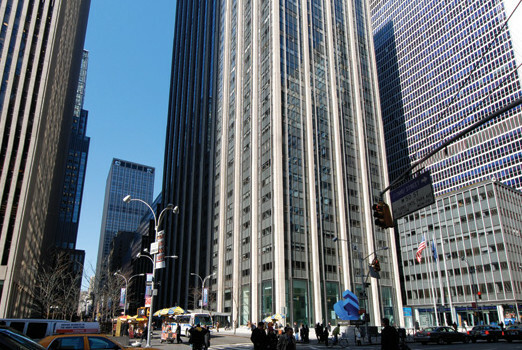 Rockefeller Group announced that Blank Rome has leased 138,000 s/f in 1271 Avenue of the Americas, the 48-story skyscraper built in the modern expansion of Rockefeller Center to the west side of Sixth Avenue. Blank Rome will occupy floors 15 through 17, as well as part of the 14th floor, with possession in the fourth quarter of 2018. The AM Law 100 firm, which has 13 offices and more than 600 attorneys and principals, has had a presence in New York since 2000. Blank Rome plans to relocate from the Chrysler Building in 2019. The new lease brings the leasing total at 1271 Avenue of the Americas to more than 1.1 million square feet since Rockefeller Group began a complete redevelopment of the building in 2016. Designed by Pei Cobb Freed & Partners, the redevelopment project includes a new glass curtain wall, restoration of the building’s landmarked lobby, new elevators, plazas and building systems. Work is scheduled for completion by Q1 2020. “We established our New York presence in 2000 when we combined with Tenzer Greenblatt LLP—a firm with New York roots dating back to 1937,” said Alan J. Hoffman, Blank Rome’s Chairman and Managing Partner. “We are excited that we will call 1271 Avenue of the Americas our new home next year,” said Norman Heller, Administrative Partner of Blank Rome’s New York office. The Blank Rome leasing team was led by Martin Luskin, Michael Mullman, Stuart Kaplan, Norman Heller, and Henri Chalouh. Blank Rome was represented by Ken Rapp, David Kleinhandler, Tim Dempsey and Zachary Weil of CBRE. Building ownership was represented by a CBRE team, including Mary Ann Tighe, Howard Fiddle, John Maher, Dave Caperna, Evan Haskell and Sarah Pontius, in coordination with an in-house Rockefeller Group leasing team including Ed Guiltinan and Jennifer Stein.